You feel it the moment you step into the newly redesigned lobby of the Royal Sonesta Boston—a sleek and elegant new look and feel, featuring vast windows that overlook the lovely Charles River and the city’s unmistakable skyline. 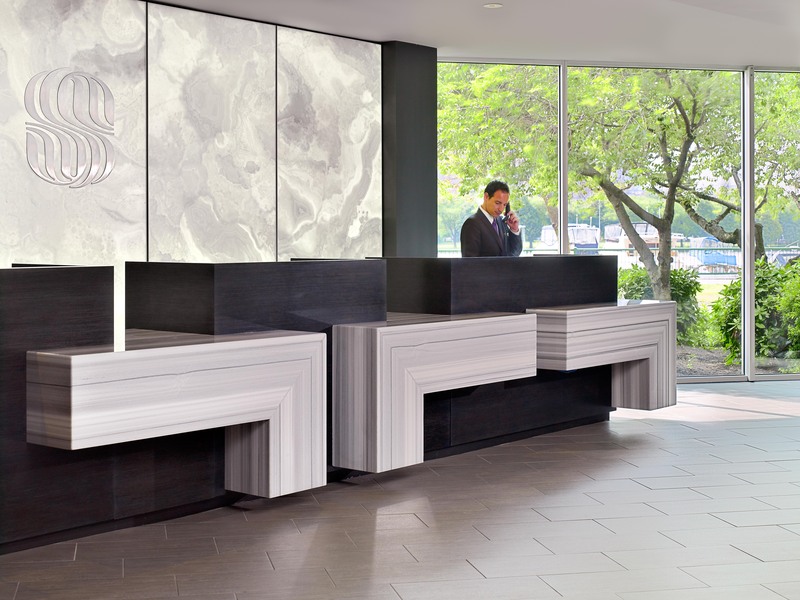 Neutral and subtle palettes give the lobby its gracious feel. Robust splashes of color engage the senses. Of course, the lobby only begins to tell the story of the ambitious renovations inspired by this remarkable setting. Exciting time, indeed. With two new outlets adjacent to reception, Sonesta’s lobby is buzzing with activity morning, noon and night. At Studio, you can grab your favorite specialty coffee drink, house-made pastry or even a deli sandwich for lunch. The café serves PJ’s Coffee – from the southern coffee roaster and long-time Sonesta partner based in New Orleans – along with breakfast, lunch, and snacks, all conveniently packaged to take to the airport, office, or for a leisurely picnic on the Charles River, which is right outside our door. At Motif, our new contemporary lounge and meeting place located in the lobby, you can gather with friends and colleagues for cocktails before dinner. Full bar service on a martini cart sidles right up to you, so you can watch as creative cocktails are mixed tableside – Liquid Art at its best! It’s a unique and fun accent to an evening out and an engaging way to end a day of meetings. You can also indulge in small plates here that are perfect for sharing. Speaking of meetings, the new Longfellow Suites offer waterfront views from 2,100 square feet of new indoor and outdoor event space with its own Charles River-facing terrace. It’s the ideal venue for meetings, weddings, holiday parties and other social events. The hotel has also introduced the 3,000-square-foot Riverside Terrace, which has become one of Boston’s premier outdoor venues for weddings, lunches and receptions – accommodating up to 250 guests with views of the Charles River and Boston’s classic skyline. The new touches carry through to 200 of the hotel’s guest rooms. Stylish and tasteful, you’ll appreciate all the comforts and amenities you’ve come to expect from Sonesta’s full-service hotels, including free high speed wireless internet. And to bring a touch of the Charles River into your space, each room is adorned with touches of soothing blue. What’s more, our renovated fitness center helps you stay in shape whether you’re traveling for business or pleasure. Get a workout on our Cybex machines and treadmills. Or swim the lanes of one of Boston’s and Cambridge’s largest pools, kept clean with a chemical- and chlorine-free electrolytic system, with views of our seasonal sun-deck and the skyline. The Royal Sonesta Boston is only one of our recently renovated hotels. To view slideshows of other updated Sonesta properties around the U.S., visit www.sonesta.com/newlook.